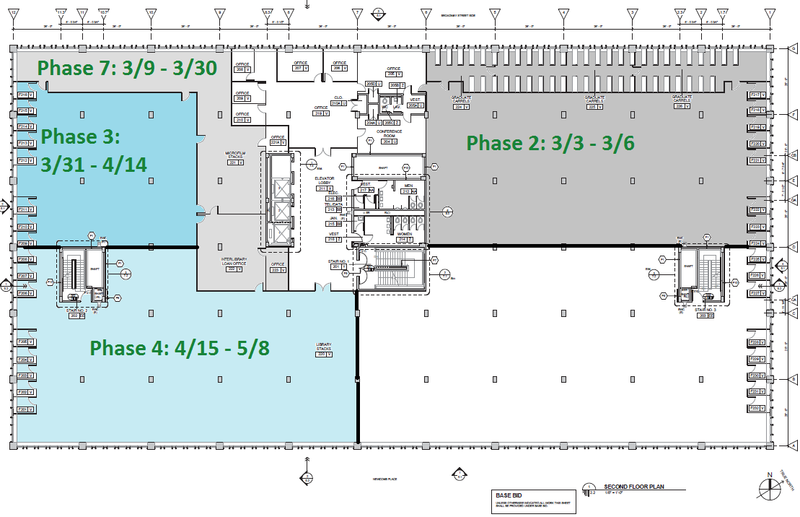 The construction contractor has released a revised schedule for the installation of the fire suppression (sprinkler) system for the remainder of both the 1st and 2nd floors. 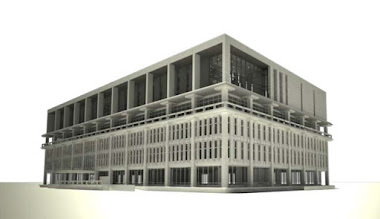 The sprinkler system has already been installed over the area designated as Phase 1 that covered the library's Technical Services division, its loading dock, and its mail room. The installation has also been finished in the Phase 2 area that included the southeast side of the building including the elevator lobby, help desk, and Learning Commons, although rebuilding the ceiling in much of this area is expected to continue through February. The following is the sprinkler installation schedule for the remaining areas of the floor and for information about how requesting books from construction-affected areas see these directions. Once the 1st floor work is complete, the sprinkler system subcontractor will return to the 2nd floor. Area location: This a newly designated area in southwest quadrant of the building limited to the staffed areas of Microforms & Newspapers and Interlibrary Loan (ILL). The abatement contractor that is removing the library's elevator lobby ceilings is working faster than anticipated and ahead of schedule. Abatement crews were originally scheduled to finish the 2nd floor ceiling removal and abatement on Jan. 17 but will wrap up instead next Tuesday, four days early. It is likely that crews will start preparing to build their abatement containment area in the 3rd floor elevator lobby as early as next Monday, Jan. 12. The 3rd floor ceiling removal and abatement would take about a week once its containment area is up. It should go quicker than in the 2nd floor lobby, because a smaller amount of ceiling on the 3rd floor needs to be addressed. While the 3rd floor elevator lobby is closed alternate access to the Innovative Learning Center (ILC) area and Center for Library User Education (CLUE) classrooms is expected to be available through their emergency side exits, as when the central stairs were closed earlier in the construction project. Once the 3rd floor lobby ceiling is removed the abatement project will be largely finished with access through all the building’s elevator lobbies restored. Exactly how long it will take to fully rebuild the 2nd and 3rd floor ceilings is still unknown, since some initial engineering, specification, and subcontractor issues not likely to be repeated have delayed work on rebuilding the similar ceiling in the 4th floor lobby, which was removed before the fall study and exam period. With some of these issues now resolved, the construction contractor is estimating that the ceiling work in the 4th floor lobby may be finished by the end of next Friday, Jan. 16. 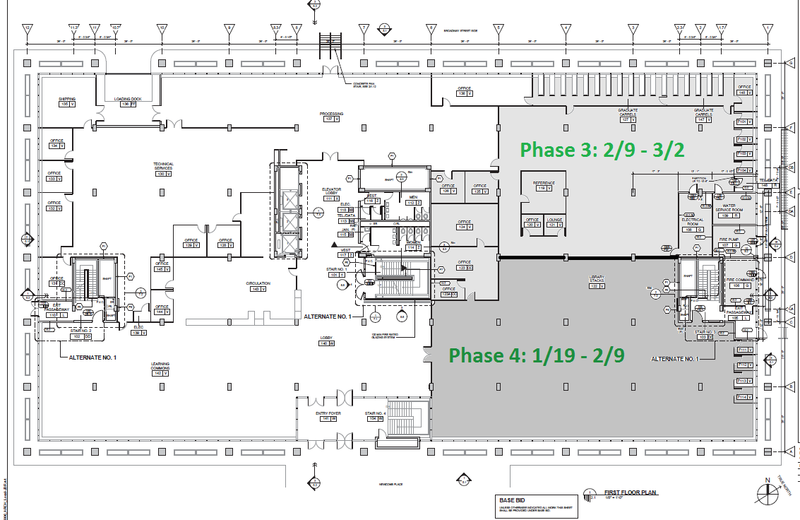 1st Floor Ceiling: The construction contractor is now estimating the large area of ceiling removed on the 1st floor, above the elevator lobby and a portion of the Learning Commons, will be fully replaced and the area returned to normal by Feb. 28. Indeed, the contractor would like to have all of its lower floor projects done by the end of February as well, which indicates an intention to split ceiling crews to work on more than one floor simultaneously when needed. Starting Monday (Jan. 12) , most of the upcoming work to rebuild the ceiling will be scheduled for late shifts working from 10:30 pm to about 7 am. Freret Side Stairwell Closed: The former emergency stairwell on the Freret Street side of the building is presently closed while crews install new stairs and landings there for the 5th and 6th floors. While this work is underway the stairwell can be used in the event of an emergency, when the work above would be required to stop, but otherwise should be avoided. 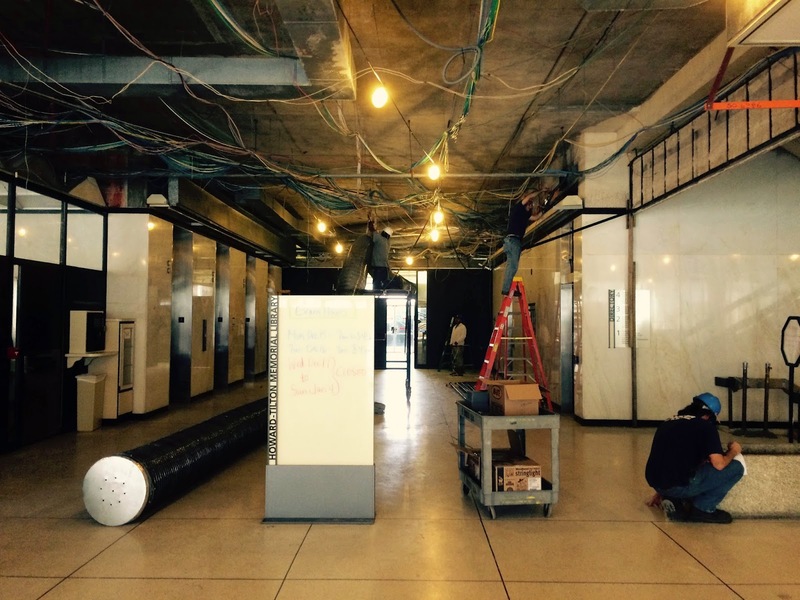 Elevator Problems: With work begun to replace the building’s elevators and extend them to cover floors 1-6, two of the library's three elevators have been taken out of service and dismantled. This week the single remaining elevator was plagued with break downs. Schindler Elevator Company is reported to have isolated the cause of the problem and a solution has been planned. The cause is apparently located in the controls behind the buttons in the elevator car itself, rather than in its main control panel above that was rebuilt during the library closure. Consequently, the elevator car controls will now be replaced with brand new parts that would have been installed at a later point once this elevator is eventually taken out of service. These are some of the same new parts the other two elevators are being given as part of their overall reconditioning while they are extended to reach the new 5th and 6th floors. The work will be done ASAP, as soon as the new parts are brought in, and may be completed by early next week, if not sooner. Construction crews were able wrap up projects in order for the library to reopen on schedule Monday, Jan. 5, after which, for several weeks anyway, library users will likely find the construction work more noticeable than at any previous point in the project, i.e., many more things out of place, more construction dust or debris than usual, and several areas pretty torn up. This is especially the case in the 4th floor elevator lobby, a broad area of the 2nd floor surrounding the elevator lobby, and a broad area surrounding the 1st floor lobby. The temporary untidiness is due primarily to the large scale of the lower floor interior projects undertaken during the intersession library closure. 1st Floor: On the 1st floor both the ceiling removal in the elevator lobby | Learning Commons area as well as the installation of the fire suppression (sprinkler) system in the Technical Services area were completed during the closure as planned. The lobby area looks very rough with its ceiling gone and lots of hanging wires and fixtures above. With crews in double shifts scheduled to start next Monday evening to install the lobby area sprinkler system and to begin to rebuild the ceiling, the area should look progressively better soon. 2nd Floor: An abatement contractor has already moved on to the 2nd floor elevator lobby to get a head start on removing the ceiling there. Work in the 2nd floor lobby was officially scheduled for Jan. 5-17, but addressing this work earlier will reduce disruption in the library once the semester begins. There was no “swing space” or easily identifiable areas for storage on the 2nd floor so furniture and other objects from the lobby and an affected office area behind it have been stacked in the aisle way nearby and in other areas on the same floor. During the period in which the 2nd floor lobby will be closed, the 2nd floor itself will be open for general use although it will have no elevator service. Access will be from the Dixon and Freret side stairwells. Alternate access to the library administrative office area will be through a side door from the adjacent aisle in front of the general stacks on the Dixon Hall side of the building. Elevator Service: Elevator #1 is now running again and fully operational, with Schindler Elevator Company having completed an overhaul of the elevator’s controls during the library closure. 4th Floor: Crews are working to rebuild the ceiling that was removed in the 4th floor elevator lobby and this may take a couple more weeks. 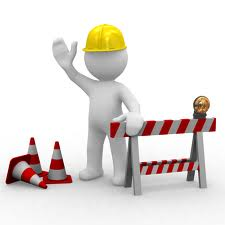 In the adjacent Music & Media Center workers have cleaned up after a water leak from an overhead drain pipe that occurred on Friday, Dec. 19, just a few days into the library closure period, but library staff will be dealing with some residual impacts for a while. The leak began when a company installing window seals was said to have driven its lift over the exposed drain on the balcony area above. Fortunately, water had been pouring in only for about 10-20 minutes or so before it was discovered. The area was being checked regularly, since the rain outside was heavy and this was a known trouble spot. After the leak about 270 books in varying condition ranging from partially wet to very wet were moved to our freezers at the library's Recovery Center at 900 S. Jefferson Davis Parkway. With no regular elevator service in the building at the time, construction workers were enlisted to carry packed boxes of books up to the new 5th floor and down the buck hoist external elevator. Then the workers transported them to the Recovery Center in the cabs of a convoy of pickup trucks.